Includes cranberries! This seasoning blend brings the cool and fresh flavors of the tropics to your summer table. Also great with fresh lettuce as a cool wrap filling. Add: boneless skinless chicken breasts, pineapple tidbits, mayonnaise, pecans to this delicious cranberry chicken salad. Serves 8. 1. In a medium bowl, combine all ingredients except rolls. Stir until well blended. 2. Cover and refrigerate at least one hour or overnight. 3. Spoon equal portions of chicken salad onto crescent rolls and serve. Serving Suggestion: For a lower fat version, omit the mayonnaise. 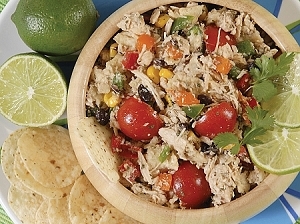 The chicken salad will not be creamy, but will still have a great flavor and texture. To make this version a little sweeter, add some of the pineapple juice. * May substitute 2 12.5-ounce cans of chicken. Includes cranberries! This seasoning blend brings the cool and fresh flavors of the tropics to your summer table. Also great with fresh lettuce as a coolwrap filling. 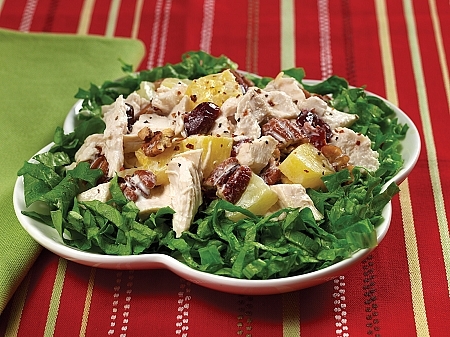 Add: boneless skinless chicken breasts, pineapple tidbits, mayonnaise, pecans to this delicious cranberry chicken salad. Serves 8.